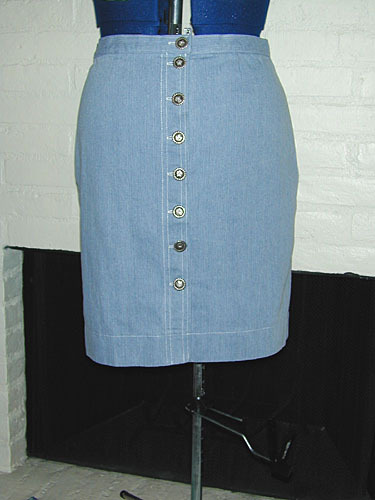 Skirt A has front button closure, topstitched waistband and carriers. Pattern suggests Cotton Blends, Poplin, Gabardine, Lightweight Linen, Damask, Denim. I like the styling of the button-front straight skirts (pencil skirts?) I’ve seen around lately. The bonus is this skirt hem. It hits at the perfect spot so no need to take it up. I only wish they would specify whether or not to use stretch fabric. I’m sure it is a matter of having more experience to make that call, but still, it would help me out. I cut a size 18 because my denim had no stretch and hoped for the best. I also used slightly larger buttons. The pattern calls for 3/4″ buttons but I couldn’t find any I liked. So, I settled for 7/8″ silver buttons with some kind of patina and respaced the buttonholes so the bottom button was high up the skirt. I think I will try this again in a size 16 using stretch black sateen for a dressier look and to see if and how the sizing/fabric combo makes a difference. I think this is a versatile skirt style and have no trouble finding tops to wear with it. A new TNT for me! It looks gorgeous! You did a fine job and I love the metal buttons. I think they go very well with this style! I’ve been loving everything you’ve been making lately. I think the metal buttons look great on this skirt too. The skirt looks fabulous, and your topstitching is impeccable. Your skirt looks wonderful. I have this pattern and fabric = gotta get to it!